I established Beacon Art Project with Nicola Streeten in 2004, Beacon Art Project is a UK based; non-venue artist led organisation curating, creating and connecting spaces for audiences, artists and art. Committed to working with audiences and artists of all ages we producing events and commissioning artwork for non-gallery spaces, usually heritage sites. Since 2004 Beacon has commissioned context specific artworks providing opportunities for people to experience contemporary visual art in non-gallery spaces, usually heritage sites. Committed to working with audiences and artists of all ages Beacon has worked regionally, nationally and internationally with audience engagement at the forefront of its mission. With its first project in 2004 Beacon established a model of commissioning context specific artworks exhibited in heritage sites in rural Lincolnshire, UK. Beacon facilitated audience engagement with the artworks by taking the audience to the art on guided coach excursions between the heritage sites to view the commissioned artworks. Beacon has developed its model of commissioning artworks, working with heritage sites, artists and audiences to create social, non-hierarchical and discursive spaces in which to encounter contemporary art. Beacon Art Project has extensive experience of successfully presenting challenging contemporary art in established heritage settings in the United Kingdom, working with local authorities and national heritage organisations such as the National Trust, English Heritage using sites such as Calke Abbey, Woolsthorpe Manor, both National Trust properties and Ayscoughfee Hall. Since 2004 Beacon has commissioned and worked with over 100 artists including Bruce Asbestos, Phyllida Barlow, Catherine Bertola, Karla Black, Marcel Broodthaers, Jimmie Durham, Doug Fishbone, Roger Hiorns, Jack Strange, Jessica Voorsanger, Amanda Coogan and Bob and Roberta Smith. Beacon was one of the partner organisations of EM15 collaboration between artist-led organisations and institutions from the East Midlands; One Thoresby Street, Nottingham; New Art Exchange, Nottingham; QUAD, Derby; Nottingham Trent University and The University of Nottingham. 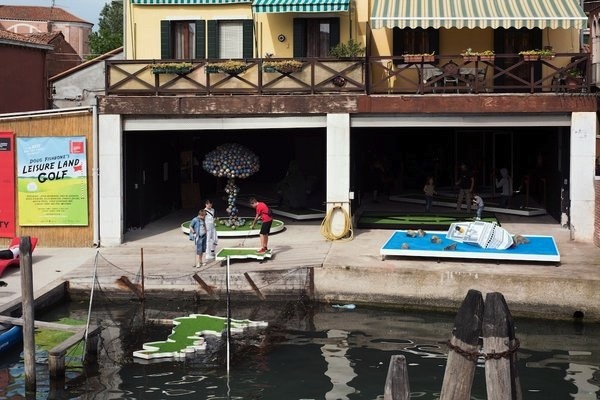 http://em15venice.co.uk For the 2015 Venice Biennale EM15 commissioned two projects for its premiere presentation at the Venice Biennale: Doug Fishbone’s Leisure Land Golf a fully playable mini golf course. For the 2015 Venice Biennale EM15 has commissioned two projects for its premiere presentation at the Venice Biennale. 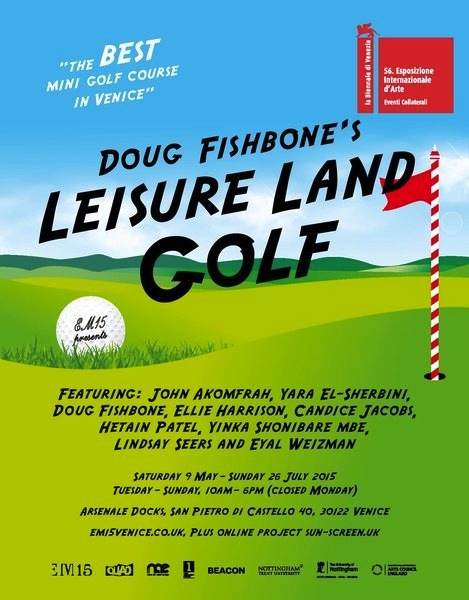 The first Doug Fishbone’s Leisure Land Golf a fully playable mini golf course. John Akomfrah, Yara El-Sherbini, Doug Fishbone, Ellie Harrison, Candice Jacobs, Hetain Patel, Yinka Shonibare MBE, Lindsay Sears and Eyal Weizman each created one of the nine holes. Both projects responded to EM15’s curatorial approach to the 56th Venice Biennale – The Leisure Principle. The Leisure Principle considers the concept of tourism and trade as a metaphor to explore current global economic complexities through one of the defining principles of leisure, that of consumption and how this consumption shapes our identity. B.professional is an integrated programme of development opportunities for artists, audiences and arts professionals. Its four strands B.resident, B.mentored, B.talking and B.audience come together to create meaningful spaces of connectivity for artists and their audience. B.resident is a series of three artist residencies in which each artist will be provided with a fee, studio, living accommodation and mentoring support. Each two-week residency will culminate with an exhibition and a presentation by the artist as part of the B.talking programme. Alexandra Pary, Lorrice Douglas and Cedar Lewisohn were selected to B.resident following a national call for submissions. Offer the selected artists the time and space to focus on the development of their work. Challenge the selected artists to develop their understanding of how a contemporary art practice may reside in a rural context. Develop longer-term relationships with the artists Beacon works with. B.mentored, running concurrently with B.resident, focuses on the development of critical thinking around an individual artists practice. Open to application from artists living or working in the East Midlands region the following artists were selected GÂST, Marc Renshaw, Ellie Collins, Scott Mason, Alice White and Claire Morris-Wright. Each artist will receive mentoring sessions tailored to meet their individual needs and will present their practice at a B.talking event. B.talking a free programme of events to which you are invited to B.audience. Each B.talking event is held in a social and convivial setting providing a user-friendly forum for the sharing of opinions, understanding, information and support about contemporary art practice. Attendees living within a 15-mile radius will offered free return travel by minibus. The commission brief asked the artists to embrace and forefront the daily life, history and culture of Lincolnshire. Drawing on and making specific reference to the peculiarities and particularities of the Lincolnshire landscape and culture, particularly as it relates to the cyclical and durational aspect of agricultural production. Profusion was an exhibition inspired by the unique setting of Calke Abbey, a National Trust property in Derbyshire. Profusion presented commissioned and existing works by acclaimed international artists, exploring themes and ideas pivotal to the exhibition’s context. Calke’s rambling contents declare their fragility and materiality, emphasising a heightened sense of physicality and entropy. The house is purposely presented in a way that disregards established hierarchies, taxonomies and methods of display, celebrating instead the glorious disarray of a rich diversity of objects and artefacts and their testimony to the passage of time. Calke emphasises multiple viewpoints and possibilities within a framework of interconnectedness. It embraces the tentativeness of imposed categories, highlighting their relativity and debunking presumptions regarding the containment and representation of knowledge. Intervention and not interruption was at the core of the curatorial vision for Scion our aim was to deliver a structured and accumulative project that enabled an engaged visitor experience of the house, one that is subtly enhanced by the artistic interventions. Kelly Large was commissioned to take up residence at Kesteven & Sleaford High School and produce an artwork in response to this educational context located within a historic, rural town. She observed the school day, where roughly between the hours of 8.30 am and 3.30 pm, the pupils’ movements and behaviours were precisely managed and contained within the school’s boundaries. Wandering around town between these times there was little evidence that Sleaford contained three secondary schools in spitting distance of the town centre. As a consequence of the lack of presence the students had in the town during school time, the after school routine, when approximately 2,500 young people from nearby secondary schools exited the school grounds and spilled into the town centre, took on an extraordinary quality. The sheer volume of students who amassed and dispersed preoccupied the artist and the affect this had on the town. The atmospheric changes, increased noise levels, sudden traffic jams all indicated a momentary shift in the status quo, where one demographic group outnumbered all others. In the direct context of Sleaford, Our Name is Legion signaled the complex relationship the students had with the town. The appropriation of this routine, daily fluctuation as artwork looked to make vivid a daily occurrence in order to explore resident’s awareness of their town’s social structure. Each student was local, an inhabitant of Sleaford or the surrounding area, yet the mass assembly differentiated between town and school populations, temporarily defining the youth as an anonymous, culturally defined group, that was simultaneously inside the community and separate from it. This interplay between mass and individual, lack of, or excess public prominence, in a specific geographical and cultural environment, reflected to some extent the status of young people within wider society, as they start to forge an identity for themselves that is both individual and conforms to societal expectations.